Click here for PDF format. 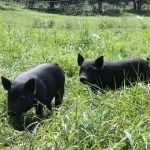 The American Guinea Hog is the ideal sustainable heritage farm pig, known for its moderate size, excellent foraging abilities, friendly temperament, excellently flavored meat and indispensable lard. While the American Guinea Hog is smaller than industrial hog breeds, it is a good-sized farm pig providing a nice, well-marbled carcass. determined though genetic testing that the American Guinea Hog is a distinct breed. Height: Adult American Guinea Hogs (at 2 years of age) range from 22 to 27 inches tall, adult males sometimes averaging one or two inches taller than females. Older animals may grow larger. Body/Length: Fully grown adult American Guinea Hogs range from 46 to 56 inches, measured from a point between the ears to the base of the tail. They have a straight to slightly arched back. From a side view, they should present a long, rectangular appearance (with flat sides and rounded corners). As a landrace breed, variations are common. 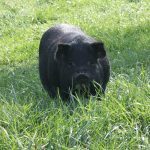 Some hogs will be taller and broader at the shoulders with slightly lower and narrower hips. should be taken to NOT overfeed, especially with grain. Excess weight will likely lead to fertility problems. Head/Face/Ears/Tail: American Guinea Hogs have medium-small sized, upright ears (sometimes slight bent at the tips in adults). 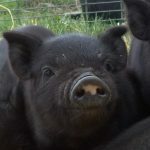 They have slightly dished faces with snouts that vary from rather short to medium-long. The tail has a single curl. Slightly forward facing eyes are common. in the breed, and may rarely exhibit. Hair: Adult American Guinea Hogs typically have medium to long, coarse, bristled, black hair, some tinged in reddish-brown tones or bluish-black tones. should be a goal of breeders to maintain the good temperament of the American Guinea Hog. wallow, minimal shelter from precipitation and wind, dry bedding, and perhaps a small amount of grain. They thrive where ranging and grazing is a constant activity giving them plenty of exercise. They are minimal rooters when good grazing and adequate feed is available. Life Expectancy: The expected life span of the American Guinea Hog is 10-15 years or until they are ready for culling and slaughter as farm livestock, providing excellent meat for the table. 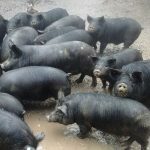 Carcass: At six months, the American Guinea Hog may provide a nicely marbled carcass of up to 75 pounds hanging weight of gourmet-quality highly-flavored meat. Fat tends to peel easily from the meat. 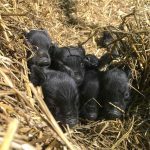 There is no need to castrate young male hogs intended for slaughter at six months of age.